This is a milestone post for two reasons. The first is that this is the 100th blog post on Man Fuel (!!!) and the second (although much more important) is that today is the second anniversary of when I started dating my fiance, Sophia. That’s right, I said, “fiance.” As a doubly special post, this is the story of how I proposed, and the events of that one day in Paris, France. I apologize in advance for the personal nature of this post and I realize that this isn’t for everyone. So… unless you like mushy stories with some food stops thrown in, why don’t you check out this rugged recipe instead. Back in June, Sophia and I took a trip to Paris simply because we both had some time off and we wanted to take a memorable vacation together. Even though I’d already visited Paris once before, I was more than excited to return and show Sophia around one of the most beautiful cities in the world. It didn’t hurt that I got to again eat some of the greatest food I’ve ever had. We spent six days and five nights in Paris and on the second to last day (June 18, 2013) I proposed. 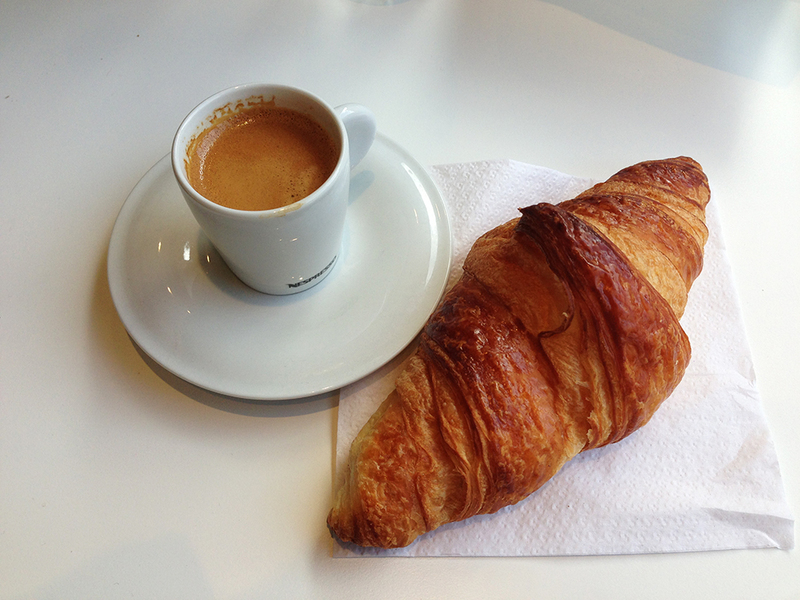 The day started off like almost every other day we spent in Paris with a crispy croissant and an espresso from whatever bakery struck our fancy. On this day, we decided to once again visit Malo, the bakery directly below the flat we were renting. As I comically sipped espresso from a tiny cup between mouthfuls of flaky, buttery, croissant, Sophia and I discussed our plan for the day. We were to go see the Rodin Museum, then walk to a famous bakery called Laduree before going to yet another famous bakery called Poilane, eating crepes for lunch, and then finally visiting Luxembourg garden. We had a full day ahead of us despite having already had four days packed with exhausting touristy delight. Although I was calm and more than fascinated with the beautifully grotesque forms that emerged from Rodin’s mind, my own mind was racing as I considered how I was going to actually propose to Sophia. The problem that kept arising since we arrived in Paris was that there simply was no good, private, perfect place to propose. Since leaving the United States, I was carrying a fairly expensive diamond ring in a messenger bag that I never let out of my sight. I had been waiting for just the right time to propose, but I still hadn’t found the time five days later. For example,two days before, we had traveled by train to the sickeningly luxurious Palace of Versailles where I thought I would find the perfect proposal spot amidst the French opulence. 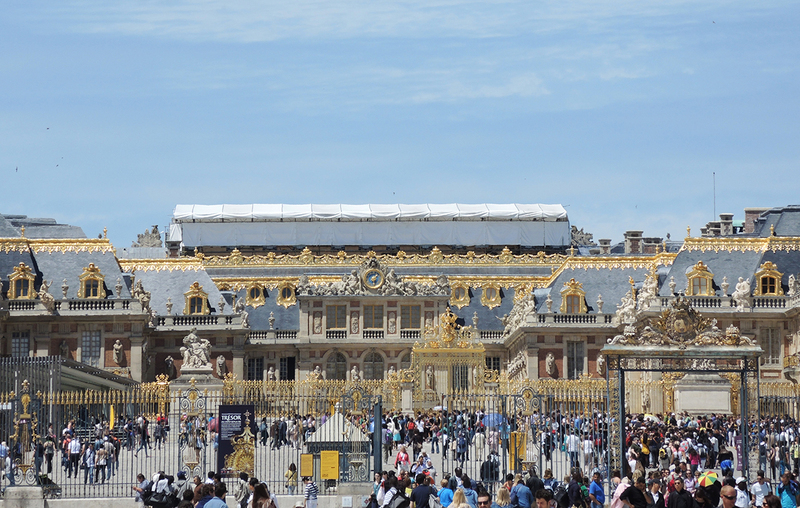 I was sorely disappointed to find out that a visit to the Palace of Versailles was like riding a train during rush hour – sweaty people everywhere crammed shoulder to shoulder. So, I kept the ring in my messenger bag, the bag strapped across my chest, and my hand on the flap as we plodded our way through France for two more days. 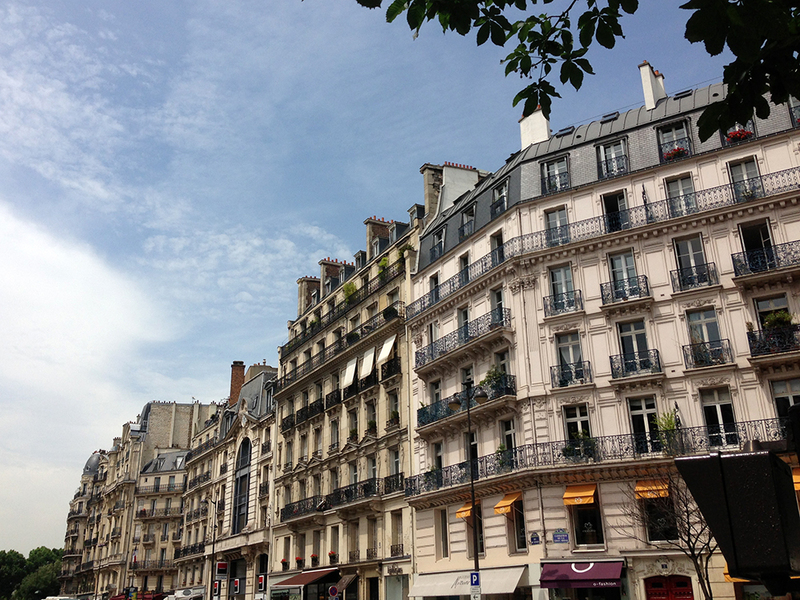 As we left the Rodan museum, we walked the scenic and historic streets of Paris in search of baked goods. Sophia’s phone map led us unwittingly to our destination of Laduree. Inside the simple shop were baked goods of all colors, shapes, and sizes. More specifically, Laduree had an impressive display of macarons advertising more flavors than a Baskin Robbins. Not wanting to limit our mobility or deplete our bank accounts too much further, we opted to purchase yet another set of four very expensive macarons of varying flavors. Sophia looked at me when we stepped outside of Laduree and asked, “I think that other bakery isn’t too far away. Do you mind if we check it out?” Despite sweating through my undershirt in the humid summer air, I half-smiled and mumbled, “Sure.” Today was Sophia’s turn to crack the whip since I’d been dragging her all over Paris for the last four days to make sure she saw all of the sights before we left. With the macarons safely tucked away in my bag next to the ring, we made our way over to Poilane. During the walk to Poilane, I once again admired the Parisian architecture that decorated the curve of the buildings lining the similarly curved streets, which so many of the locals must take for granted. There’s a reason Paris is considered one of the most romantic cities in the world, but privacy in the middle of the city for two people in love was proving not to be one of them. At Poilane, we saw a classy, yet rustic looking bakery. The air was filled with bakery fragrances and a light dusting of flour hung in the air. The baked goods looked incredible even though the prices were mind-boggling. Everything in Paris is expensive, but these were baked goods selling at the price of a good steak in the United States! Sophia purchased herself a small box of plain cookies, which made her happy and I was happy that she found something to purchase, so we could head out and eat something for a late lunch. On our way out, Sophia got very excited and turned her back to the people entering Poilane. She mumbled something to me that I couldn’t make out, which happens quite often when Sophia is trying to be quiet. She cutely assumes that everyone can hear everything she is saying at all times and so she speaks at such a low volume that even with her mouth against my ear, sometimes it’s hard to know what she’s saying. Nonetheless, I gathered that she had spotted famous cookbook author, Dorie Greenspan. As it turns out, after a series of polite tweets, Ms. Greenspan informed me that she was not, in fact, in Paris although she would love to be there. It was fun seeing Sophia so excited and simultaneously terrified to even approach her pseudo-Dorie. (Fun fact: Sophia swears she spotted Conan O’Brien out and about near Notre Dame while we were eating lunch one day. It turns out that he actually was in Paris at the same time we were!). We left Poilane and the hunger in my belly overtook thoughts of proposing and replaced them with dancing crepes instead. We made our way back across the city towards Montparnasse Boulevard where we had previously encountered a side street that we aptly named, “Crepe Alley.” Essentially, almost every single restaurant on that street was a creperie. We had researched a few of the restaurants in Crepe Alley, but after a few recommendations for restaurants turned out to be sour tips, we decided to pick our own creperie to try. We ended up at La Creperie Brettone, which turned out to be a lovely little place with the nicest wait staff. We ordered savory crepes for lunch along with two cold beers to cool down from the summer heat. During our meal, Sophia spilled one of those beers all over me. She apologized profusely and said, “This is who you’re dating, just so you know. I’m a clumsy girl.” I smiled and thought to myself, “I’m going to marry that clumsy girl,” as I wiped spilled beer from my jeans. Carlsberg Beer spilled on me. Full of delicious crepes, we waddled down the street clutching our Crellies. What is a Crelly? Well, it’s a phrase we coined after eating too much crepe one day. It means a belly full of crepes. So, with our Crellies in tow, this time we were on our way to Luxembourg Garden. I’d been to the gardens before on my last trip to Paris and I remembered that they were stunning. I knew that this would be my last chance to propose in France in a decent place. The only other option was to propose in the somewhat grody flat we were renting, but that was my absolute last resort. We entered the gardens from the side and made our way towards the front entrance so that we could walk down the beautifully shaded path leading to the Senate’s Palace. I remembered the garden well and we both enjoyed the simple beauty of the plants contrasted with the exquisite detail of the buildings. After walking a bit, we stopped and sat down together on a shaded bench to enjoy the absurdly expensive macarons we had purchased earlier from Laduree. 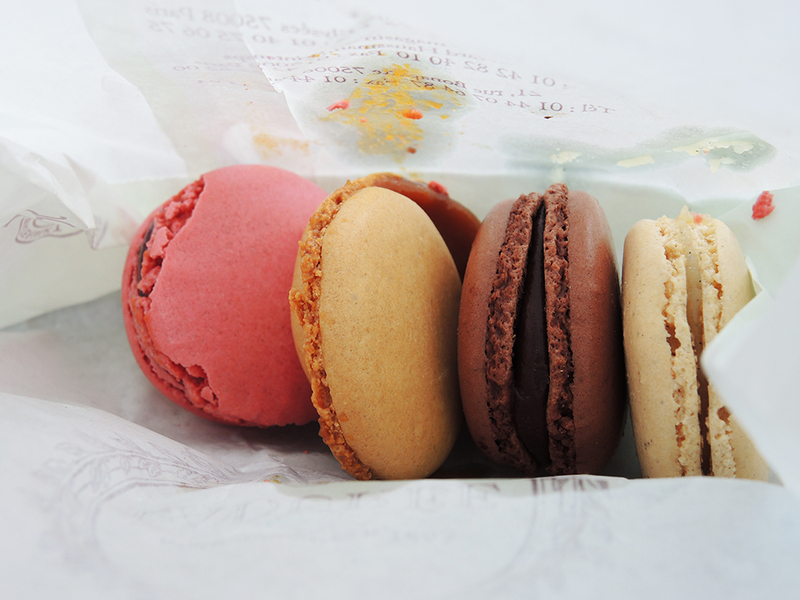 We sat in the warm shade and alternated bites of the chocolate, vanilla, caramel, and raspberry macarons. We commented on what we liked and didn’t like between sweet mouthfuls. Before coming to the garden, I already had in mind where I wanted to propose. It was just a matter of making our way over there and finding the right moment. 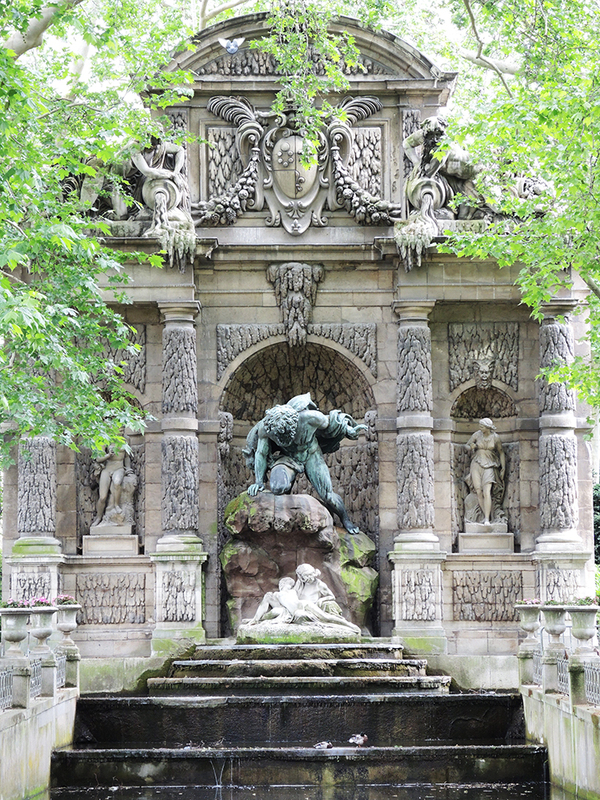 On my previous trip to Paris, I saw the Medici Fountain in Luxembourg Garden and fell in love with it. It’s one of my favorite places in Paris. I can’t explain why I like it so much, but part of it might be that it looks so anciently rundown while simultaneously retaining its beauty. 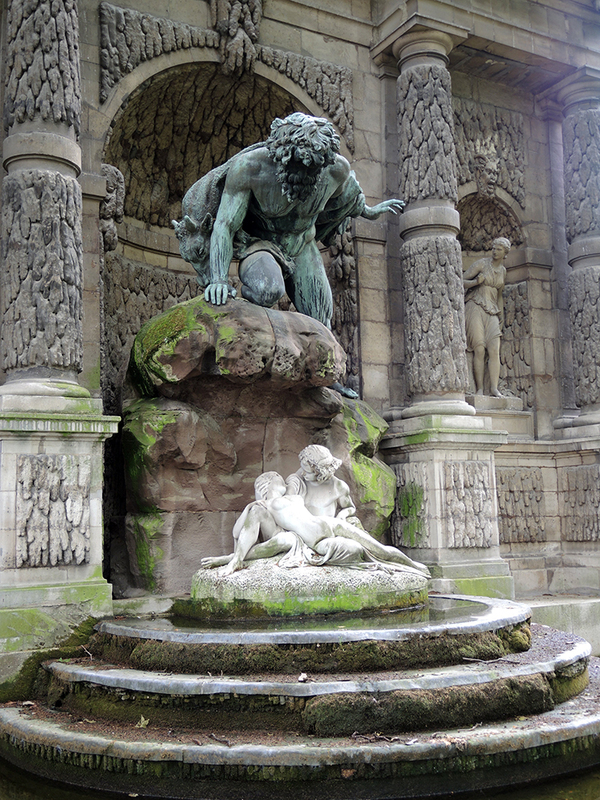 There are no aquatic frills to the Medici Fountain. The water simply bubbles down the sides without reaching any heights. The water is murky like a pond and has floating leaves in it that the ducks push around as they paddle by. It’s just a lovely place without much fanfare off to the side of the main garden. When we finally approached the fountain, my heart dropped. It was packed full of people. The last time I was in Paris, the fountain was basically deserted because I went in August when apparently all of Europe leaves Europe. I pushed passed a few people and snapped some photos with a scowl on my face. This was my last real chance to propose somewhere special and it wasn’t panning out! I looked along the sides of the water and noticed people sitting in outdoor chairs side by side all along the fountain. There were so many people there that I couldn’t really even get to the front so I could properly photograph the fountain. Not one to be deterred after coming all of this way, I told Sophia that I wanted to get some photos up close, so I started pushing passed the people towards the front. 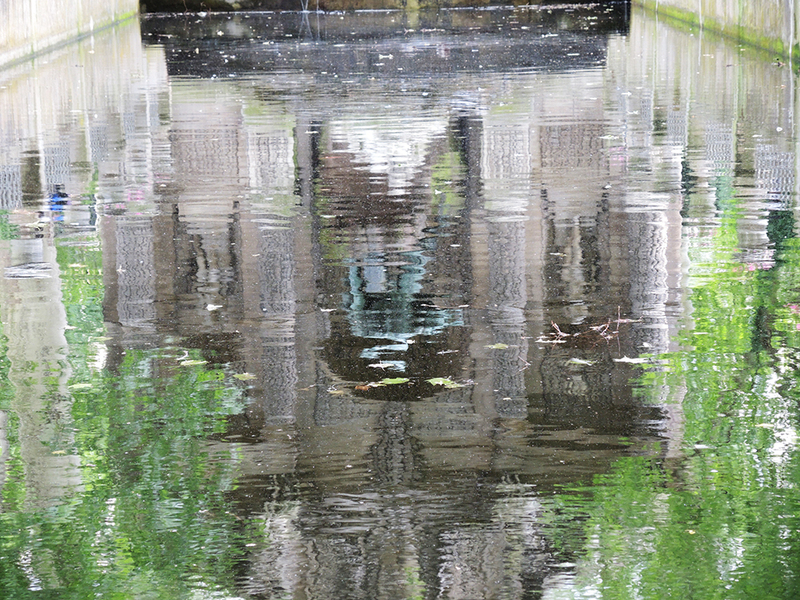 When I finally got closer to the main sculpture of the fountain, that’s when I saw them. Two chairs. Empty. Right at the front of the fountain. I twisted my back and looked towards Sophia waving frantically for her to follow me. She made her way through the people much more politely than I did and met me right in front of the fountain. Not only were there two chairs available, but they were actually a decent distance away from the next set of chairs. As with most situations, many people probably gave up when they saw the throngs of people lining the fountain and never even bothered to head towards the front (Rude American: 1. Polite Europeans: 0). We sat down, I snapped some photos, and we just enjoyed the fountain for a few minutes. I still wanted a bit more privacy though, so I asked Sophia to turn her chair directly towards the fountain instead of facing the pool of water. That put our backs to the closest people to us who were about 12 feet away. When she asked, “why,” I told her I wanted to take our picture using the timer on my camera, so I needed to place the camera on a flat surface near the fountain. We took a couple of self-timed pictures and then I took her hand. “Aren’t you going to get the camera?” she asked. This is when I started awkwardly negotiating the flaps on my messenger bag so I could find the ring I’d been carrying in a death grip with me for the past five days. Finding it, I pushed the bag aside, dropped down from the chair onto one knee, and said, “Sophia, I hope we have a lifetime of moments like this.” I opened the ring box and she fake gasped, which I appreciated because I know she already figured out what I was trying to do once I started being so awkward at the fountain. And she said, “Yes,” again. Clumsy girls are where it’s at! Sophia, this romantic, sentimental guy is a keeper. Bless your life together. It’s been bugging me that I wrote “prefect.” I meant she seems perfect for you! Have you two set a date? How do some so-called European bakeries around here compare? (Or not at all?) When you first visited, did you take notes on the food? Hey! Yes, I did take notes on the food and I think I’ll be doing another Paris post sometime soon-ish. As for bakeries here, I haven’t encountered anything local that compares to French bakeries when it comes to bread and croissants.The bakeries around here just don’t have the same crispy, crusty, flakiness, that makes breads so amazing. Nonetheless, Ellie’s Bakery in Providence (http://manfuelblog.com/2013/06/18/ellies-bakery-review-providence-ri) has some really good macarons and other dessert pastries. Definitely check them out! I was here looking at your beef ribs recipe again (I make them on a regular basis) and saw you had a post about my favorite place. I was in Paris at the same time you were in 2013! Congrats! Thanks, Melissa! So glad you’re enjoying the beef ribs and Paris is definitely one of my favorite places as well.